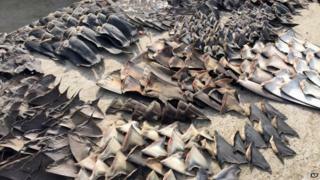 Police in Ecuador have seized around 200,000 sharks fins which were about to be illegally exported to Asia. The fins - often used to make soup - were discovered after raids on nine locations in the port city of Manta. Six people, including a Chinese national, have been arrested on charges of damaging wildlife. Interior Minister Jose Serrano said at least 50,000 sharks had been killed by the traffickers. He said the authorities had "dealt a major blow to an international network that trafficked shark fins". "We must end these criminal networks that are only interested in their own economic interests and are destroying the eco-system." Shark fishing is prohibited in Ecuador and they cannot be sold unless they have been accidentally caught in fishing nets.